The Harmar AL580XL Power Wheelchair Lift can help you take your mid-wheel drive power chair with 14" wheels along for the ride. You won't be intimidated by the easy, one-switch operation, and you won't have to fight and fumble with straps and tie-downs. A single bar slides over the seat and holds the chair in place. You won't even have to modify the chair to make it fit--the bar drops to the perfect height for secure transport. 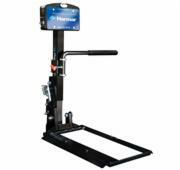 The sturdy but lightweight Harmar AL580XL Power Wheelchair Lift is the lightest lift you'll find with an understated footprint on the back of your vehicle. For convenience and looks, it's the perfect choice.